Canada Goose is committed to producing the best extreme cold weather outerwear in the world. They have manufactured innovative, high quality outerwear in Canada for over 50 years. From South Pole research facilities and the Canadian High Arctic to the streets of New York City, Stockholm, Milan, Toronto and Tokyo, people wear the Canada Goose brand because of their reputation for quality, functionality, and style. Canada Goose makes the warmest parkas on the planet and is one of Polar Bears International’s most generous sponsors. 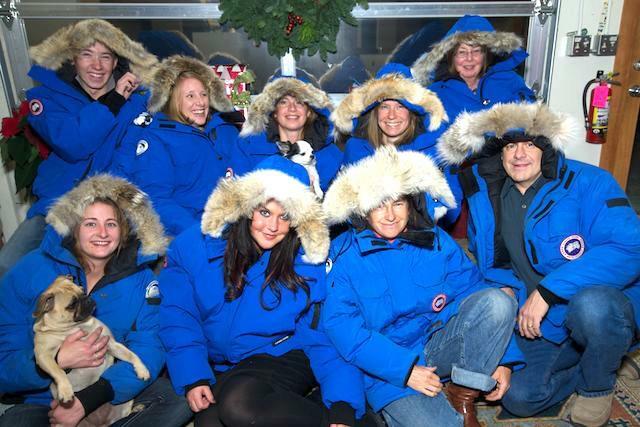 Every year, Canada Goose donates special PBI Expedition Parkas to their Research Advisory Council scientists and other team members. The clothing helps keep them warm even in the fierce cold of the high Arctic. Canada Goose also donates Chilliwack Parkas for use by the PBI Leadership Camp students and instructors, as well as their volunteers and support staff. The purchase of either parka includes a donation to PBI and a PBI membership. Polar Bears International and Natural Exposures office staff.